I was trained as an air gunner at Las Vegas Army Airfield in the Spring of 1944. From there, after a brief furlough, I was sent to Gulfport, Miss., where I joined Lt. Warren Loehndorf's crew for Operational Training Unit (OTU). After finishing OTU, we flew a new B-17G from Savannah, Georgia, to Wales via Grenier Field, New Hampshire, and Gander, Newfoundland. In Wales we left "our" new B-17 behind and proceeded by train to Oundle and by GI truck to Polebrook, about 70 miles north of London. We were assigned to the 351st Bomb Group, 508th Squadron. After several familiarization flights we were posted for our first mission on November. 6, 1944. Lt. Loehndorf's crew during training in Mississippi. Click on photo for larger view and crew names. We had trained as a 10 man crew, but by now the 351st was flying a nine man crew as it was felt that our fighter cover over the bomber formation was adequate to eliminate the need for on of the waist gunners. Only one waist gunner was assigned to fly with each crew. Typically both waist gunners were removed from the new crews and put on a waiting list while the top man on the list was put on the new crew. 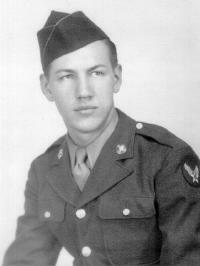 Nevertheless, I flew the first mission with my crew on Nov. 6, 1944, but my buddy waist gunner did not. Then I was taken off the crew also. That crew was shot down by flak on their third mission. Six of them parachuted out of the plane and were POWs for the rest of the war. The other three - pilot, co-pilot and navigator - died due to the flak hit or the subsequent explosion of the plane, which occurred after the others had bailed out. Since there were several others ahead of me on the waiting list, I was assigned temporary ground duty, helping a ground crew turn their two planes around for the next day's mission. Not being a trained mechanic, I couldn't do much but sweep out the planes, help gas up and hand wrenches and parts to the mechanics. I learned what it is like to wait for the return of the mission, especially since the crew I had trained with had been lost and it was some time before we got word from the Red Cross that some had survived and were prisoners. 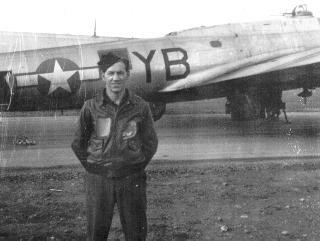 On Jan 21, 1945, I started flying again as a spare wherever a crew was short due to illness, injury, leave, transfer, R&R or completed missions. I flew 12 more missions as waist gunner and one as tail gunner (14 total) before being checked out as a Spot Jammer. I think there is something called an MOS number describing each duty and way back in my mind #317 stands out for Spot Jammers, but I may be way off. 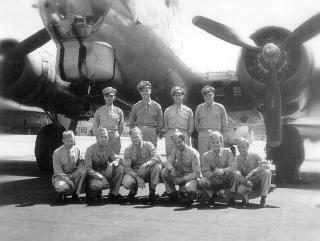 During World War II the American Air Force relied on large formations of heavy bombers on high altitude daylight raids to demolish enemy targets. However, with frequent cloud cover over the continent, especially with the approach of winter, 1943, targets were not visible from high altitude and consequently bombs could not be dropped. 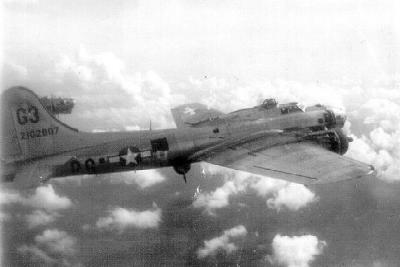 With the advent of RADAR Bomb Sights in the lead bomber to "see" through the clouds, first used by the 351st Bomb Group on October 2, 1943, the other bombers in the formation dropped their bombs when the lead bombardier dropped his. German anti-aircraft gunners, who had previously relied on visual sighting, could not see the planes above the cloud cover. They then developed a system of RADAR detection of the planes and directed their guns by RADAR to fire at the planes without actually seeing them. The first anti-RADAR measures used by the 8th Air Force and RAF, variously called "Window" or "Chaff", were bundles of thin aluminum strips, and later aluminized paper strips. The radio operator was to dispense these out of a side chute in the radio room at a specified rate. Each bundle represented some discrete return to the RADAR; I don't know if it gave the equivalent RADAR return of a plane or just what was intended. Anyway, the radio operators said they threw it out as fast as they could. This still left a trail of RADAR return where the Germans could discern the head of the trail and throw up a box of flak at the lead and into the path of the formation following. The Americans then developed a RADAR jamming system under the code name "Carpet" to counter the German RADAR. The Germans had three or four different systems (one was called the Giant Würzburg, because it was made in Würzburg), each easily identified by a trained operator with a receiver and earphones. They each operated at a discrete frequency within a band of 430 to 780 MHz. The Spot Jammer was trained to identify the various RADAR transmissions from the different transmitters. Two planes in each squadron carried jamming equipment, which consisted of a receiver capable of being tuned manually to scan the RADAR band, and three transmitters capable of being tuned manually to the "spot" frequency located using the receiver. While scanning over the band, the jammer would stop at an identified RADAR signal, then turn on a transmitter and tune it to the same frequency. The transmitter sent out a noise signal which obliterated the RADAR return signal. The RADAR would almost immediately be turned off. In that event the Germans resorted to firing up a box of flak that the formation would have to fly through. They knew where the formation was coming from and predicted the target quite accurately most of the time. This was bad enough but less accurate than aimed anti-aircraft fire. "Carpet" worked well with cloud cover but under visual conditions it was less successful; the Germans resorted to optical aiming which may or may not have been as accurate. The "Carpet" equipment was installed on the back wall of the radio room on the right side, and the operator sat facing toward the rear of the plane. There was a window on the right side behind the operator (forward on the fuselage) which could only be looked out of by leaning way back. Since the target area was busy time, there was no opportunity to look out. When I asked the crews after landing if there was "any flak today? ", they looked at me incredulously and said "Where were you?" At the time I was at Polebrook, planes were not generally assigned to a specific crew, and I could be assigned to any one of the jammer equipped planes. Therefore, since I had been flying spare for the first 14 missions and spot jammer for the next 12 (when the war ended), I had 26 missions with 20 different pilots. About half way through my tour, the gang in the barracks started to call me the "hitch hiker". Since I had no crew and individual crew art was rare by this time as crews and planes were most often randomly assigned, I was stymied for something to paint on my A2 leather jacket. The Hitch Hiker did it! In the comics at that time was a Little Hitch Hiker who always said "Nov Shmosh Kapop" (I think). 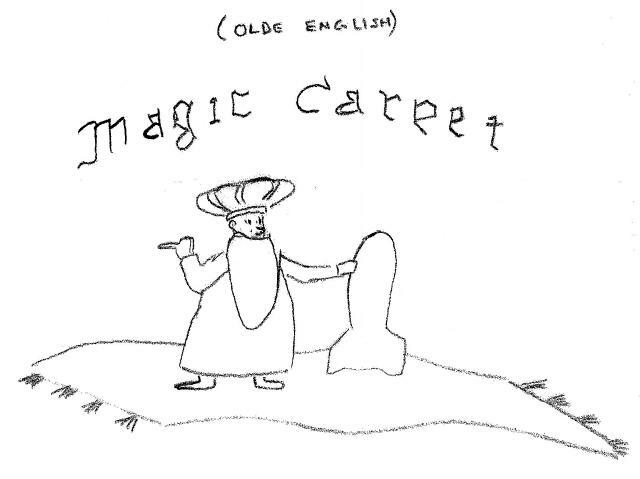 I painted him on a flying carpet holding on to a bomb and titled it "Magic Carpet" (Drawing below).